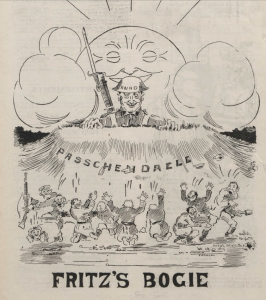 When the anticipated swift end of the war failed to materialize in 1914 and armies began to dig in, a vast network of publications emerged in the trenches. First appearing in German and Austrian units as a response to the lack of availability of national newspapers on the front, these first trench newspapers were produced from the top down, edited by staff officers. However, as the war progressed they became predominantly the domain of the soldiers, especially in the allied armies where the papers were from the very start, written by the soldiers themselves. Finding value in their ability to entertain troops, sustain morale, and build camaraderie, some senior officials encouraged soldiers to produce their own papers, others initiated official or semi-official papers (examples of official papers include The Canadian War Pictorial, published by the Canadian War Records Office of the Canadian Government). Nor were they strictly the domain of units at the front. 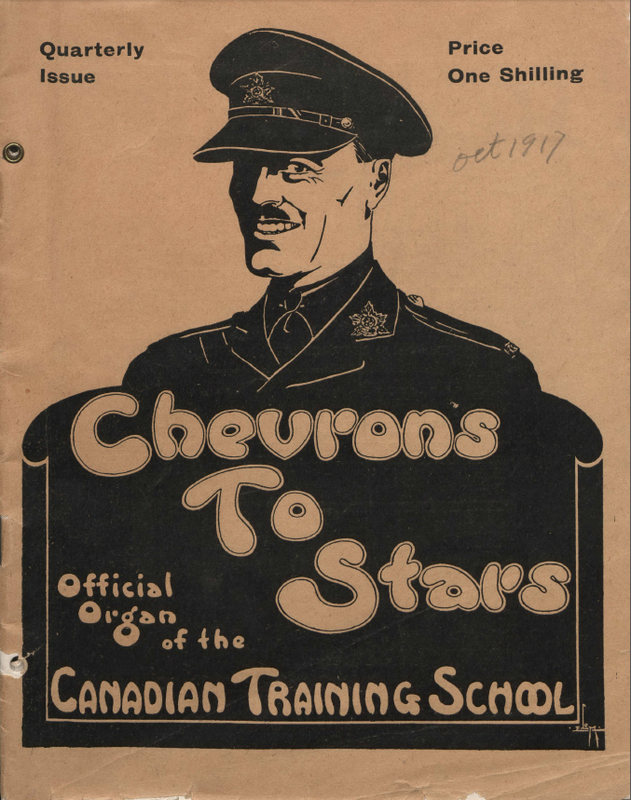 Chevron to the Stars was a trench paper that began at a Canadian training school, and the WUB (of the 196th Western University Battalion), was first published at Camp Hughes. It is unknown how many of these latter two papers were produced—at the very least only one issue for each remains—but it is apparent from the texts contained within that the editors had planned on producing further issues once their men were abroad. Unfortunately, with the exception of a handful of newspapers, most have left behind a scattered record, leaving historians to make educated guesses as to the number of papers actually circulated during the war. For example, less than 200 of an estimated 400 French newspapers have survived. A similar number is given by historians of the British and Dominion newspapers, with somewhere between 107 and 200 still in existence. While these numbers are impressive, their geographic reach is perhaps even more significant, offering historians a window into almost every theatre of the war. The majority came from “somewhere in France,” but they were certainly not confined to the Western Front. The Dinkum Oil was produced in Gallipoli and the Silent 60th was first published aboard the HMT Scandinavian. The Peninsula Press was published on the island of Imbros in Turkey and the Beach Rumours at Cape Helles on the Dardanelles. Barrak was the paper of the Imperial Camel Corps in the Middle East and The Moonraker and The Balkan News came from Salonika. Their distribution was also not confined to the battlefields. The Wipers Times (later known as the New Church Times, the Kemmel Times, the Somme Times, the B.E.F. Times, and finally the Better Times) was so popular that its editions were re-published in London for general distribution before the end of the war. But who wrote in these trench newspapers and what did they write about? While anyone could contribute, it appears that most editors came from some level of authority. French historian Stéphane Audoin-Rouzeau identifies that high-ranking officers and generals represented less than 2 percent of the editorial staff, and those that did never managed a trench paper in person. However, he also argues that “Men in the ranks were in the minority among these journalists’ of the front.” Half of the staff tended to be composed of lower ranks such as corporals, while non-commissioned officers and subalterns each made up a quarter of the staff. As for British and British Dominion papers, J.G. Fuller was able to identify the ranks from 66 editorial staffs, 27 were composed of officers, 25 from other ranks and only 14 had both. It has been whispered that too much prominence has been given to the Officers in this paper—that it is scarcely representative enough of the Unit. If that be so, it is certainly not through any wish of ours. It has always been our aim to make the paper of as wide an interest as possible, and we have on many occasions attempted to tap the rich resources that exist in the Unit. … therefore again we take this opportunity of saying that the columns of the paper are always open to everyone in the Unit, and that any articles for publication, or items of interest will be gladly received. 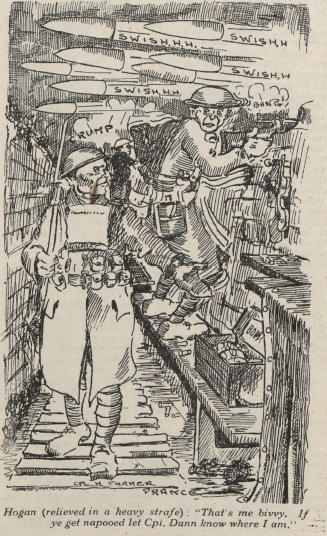 As for content, articles were predominately satirical and designed to bring humour to the monotony of everyday life in the trenches. 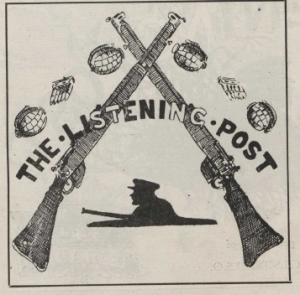 As The Listening Post exclaimed in its inaugural edition: “read me thoroughly—and laugh.—If I am not funny enough this time, then tickle your paper with pen or pencil and tell me the funny things that happen and I’ll do my bit.” It concluded this opening article with the following quote: “‘Weep and you weep alone’… ‘Laugh and the 7th Battalion laughs with you!’” The papers were filled with poems, songs, short stories, the occasional serious matter or obituary, and provided readers with the results of various sporting clubs initiated by men on the front, such as football, baseball and boxing. 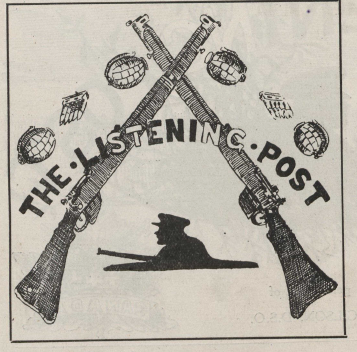 Historians have benefited from such a perspective of the war, and the contents of trench newspapers have provided the source base for several important cultural studies. In Troop Morale and Popular Culture in the British and Dominion Armies, 1914-1918 J.G. Fuller uses trench newspapers to argue that the successful transference of many facets of British civilian life to the front (i.e. sports leagues and music concerts), allowed the citizen soldiers of Kitchener’s Army to adjust to their new circumstances and therefore sustain a level of morale that could withstand the devastation of the conflict. These works stress several important themes that will form the basis for subsequent blogs in this series. First, the importance of national cultures, their transference to the front and the creation of a new trench culture that emerged in relation to those pre-existing attitudes, concepts and norms. 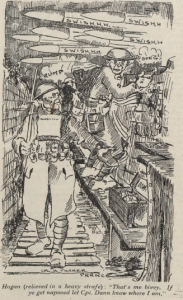 Second, the role of agency—the need to be agents in a war otherwise beyond their control influenced the need for some Canadian soldiers to express themselves in the trench press. By looking specifically at the Canadian experience I hope to introduce readers to the trench newspaper and showcase its value as a historical source. These blogs will show a side of the First World War not often depicted but worth acknowledging—that of the intense boredom and idleness that occupied most of the soldiers’ time on the front. Although Canadian trench papers have been examined in the historical literature, they have only been used in a wider context or for comparative purposes. The stories contained within them warrant their own space. The purpose of this blog is to share them. Stéphane Audoin-Rouzeau, Men At War, 1914-1918: Naitonal Sentiment and Trench Journalism in France During the First World War (Oxford: Berg, 1992), 3. For the German context see Robert Nelson, German Soldier Newspapers of the First World War (Cambridge: Cambridge Univeristy Press, 2011). Audoin-Rouzeau, Men At War, 3, 9. Robert Nelson, “Soldier Newspapers: A Useful Source in the Social and Cultural History of the First World War and Beyond,” War in History 17, No. 2 (2010): p. 171; Graham Seal, The Soldiers’ Press: Trench Journals in the First World War Kindle Edition (London: Palgrave Macmillan, 2013), Location 5519 of 5773. Malcolm Brown, “Introduction,” in The Wipers Times: the Complete Series of the Famous Wartime Trench Newspaper (London: Little Books, 2006), x; Seal, The Soldiers’ Press, loc. 762, 4870, 4775. Audoin-Rouzeau, Men At War, 9. J.G. Fuller, Troop Morale and Popular Culture in the British and Dominion Armies, 1914-1918 (Oxford: Calaredon Press, 1990), 11; Seal, The Soldiers’ Press, loc. 3850. “Our Failing,” The McGilliken 1, no. 14 (1916): p. 4. 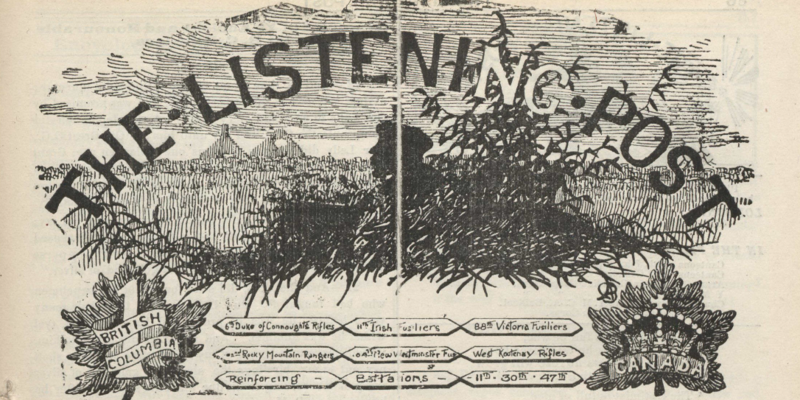 “Introduction,” The Listening Post, no. 1 (August 10, 1915): p. 1. Audoin-Rouzeau, Men At War, 2. Seal, The Soldiers’ Press, loc. 96.